Defensive Stock - What Does It Mean? What is the definition of a "defensive stock"? 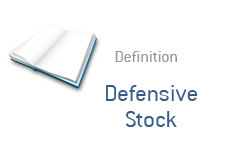 What is an example of a defensive stock? In the most recent dictionary entry, we defined the term "cyclical stock". A cyclical stock is a stock that does better when the economy is expanding, and worse when the economy is contracting. An example of a cyclical company would be a car manufacturer. Now, "defensive stocks" hold up much better when the economy is slowing or in a full-blown recession. "Defensive stocks" are companies that don't experience a noticeable downtick in revenues when the economy goes south. Food companies. Tobacco companies. Health care companies. Smokers are still going to buy cigarettes in a recession. People are still going to buy dinner at McDonald's in a depression. These are "defensive" companies, meaning - if you want to protect your portfolio in a recession, you will turn to "defensive stocks" such as McDonald's or Philip Morris. Cyclical companies, on the other hand, will perform (by definition) poorly during times of economic distress.